Another Success for the Gellert Siblings! 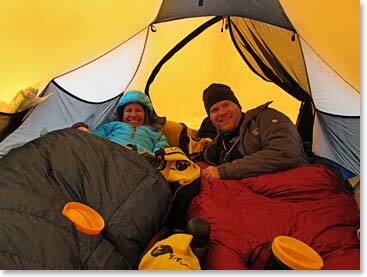 John and Kate Gellert have successfully returned from the summit of Mount Vinson, Antarctica’s highest point. Not wind, nor snow, not low visibility, nor cold temperatures could stop this team from reaching their Antarctic goal. After bad weather kept them in their tents at Vinson high camp (12,400ft/3,700m) for 5 days and 6 nights, the Gellerts finally departed for the highest point on the Antarctic continent. 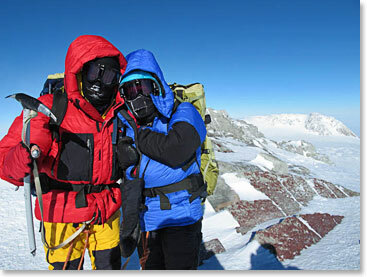 On December 8, at 8:06pm local time, the team triumphantly stood atop the summit of Mount Vinson at 16,067ft/4,897m. Congratulations to John and Kate! Their patience, positivity, and good senses of humor made the trip one to remember. The Berg Adventures crew would like to give a big thanks to John, Kate, assistant guide Pachi, all the friends they made at high camp, the ALE staff, and everyone else who helped them make this trip a success. Read more about the Gellerts’ adventure and past Vinson expeditions in our dispatches. Find more information about our Mount Vinson expedition here.